I've always wanted my very own earring collection. And now, after about five years of being an earring kind of gal, I'd like to share my eight favorite pairs. I love knowing that a lot of my earrings are pieces of art, made by artisans in places I've never been. And it makes me feel swell to have magic charms dangling from my ears. (1) These silver hoops with moonstone, pyrite, and quartz are my absolute favorite pair of earrings! They were handmade by Kimberly L Metalsmith (Boulder, CO). I was going through a major life transition, letting go of old habits and relationships. These earrings gave me so much confidence, and I'd say, a little bit of mystical power, too. I call that period of life my "yes" year -- I'd wear these earrings every single day, and I'd say yes to every new opportunity that came my way! That year, on top of work and school, I joined a belly dance troupe, I went to circus school, I hiked so many places, and I met many new friends. (2) Wearing these big moonstone hoops makes me feel like a queen of the galaxy. The light shines down on these and the moonstone roundelles give off magnificent flashes of blue! They were handmade by Maggie's Jewelry (Seattle, WA). (3) These purple lace hoops with Czech faceted glass beads are truly stunning works of art. Vicki of KnotTherapy (Herriman, UT) handmade these using a technique called "tatting", which is an old method for making lace. I purchased these for my grandmother and she loved them! I wear them now in her memory. 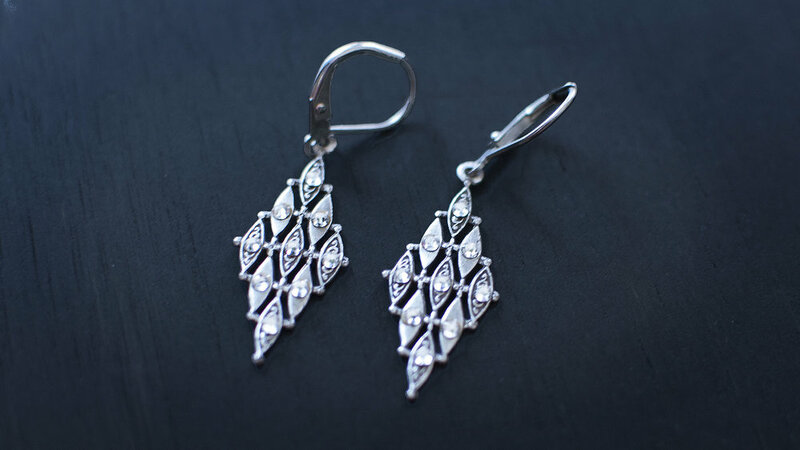 (4) This pair of art deco inspired earrings by Baked Beans are just darling. A gift from Chuck's mother. (5) Teardrop shaped raw rainbow quartz earrings -- These were a gift from Ribbons Boutique in Redondo Beach (I danced in their belly dance drum circle for a summer festival). (6) Cherub earrings from Le Unique Boutique in Torrance. This pair was also for my grandmother, since she adores angels. They're very special to me now. 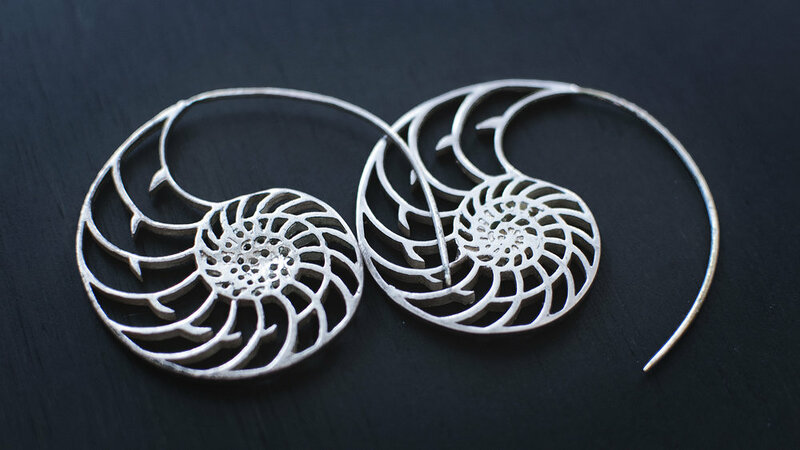 (7) Sterling silver nautilus spiral earrings made by Talismana Designs (McMinnville, OR). I have a real fascination with spirals, so I had to get a pair! Side note: this Etsy seller is really very awesome! I'm a repeat customer here. 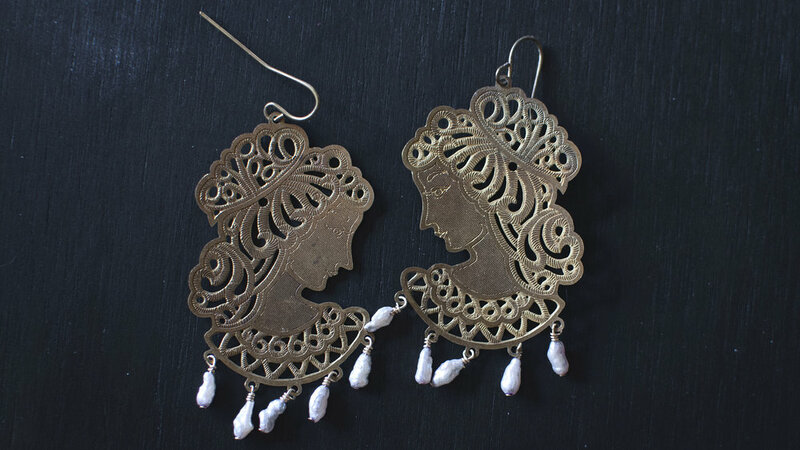 (8) Goddess earrings from a boutique in East Village (Long Beach, CA) -- I can't remember the name of the boutique, but I loved this design with the pearls. I have so many more pairs of earrings, of accordions, fish, and even ones made from doll parts. I'm sure when I'm 65 or so, I'll have quite a large collection! Grandma would be impressed! Excuse my poor attempt at a self-portrait, but I had to at least take a photo in my favorite pair! I'd love for you to keep in touch: for blog updates, follow me on insta @fairytale_slavery & facebook, too!